Up until a few years ago I was lucky enough to perform as a lead singer in several bands. 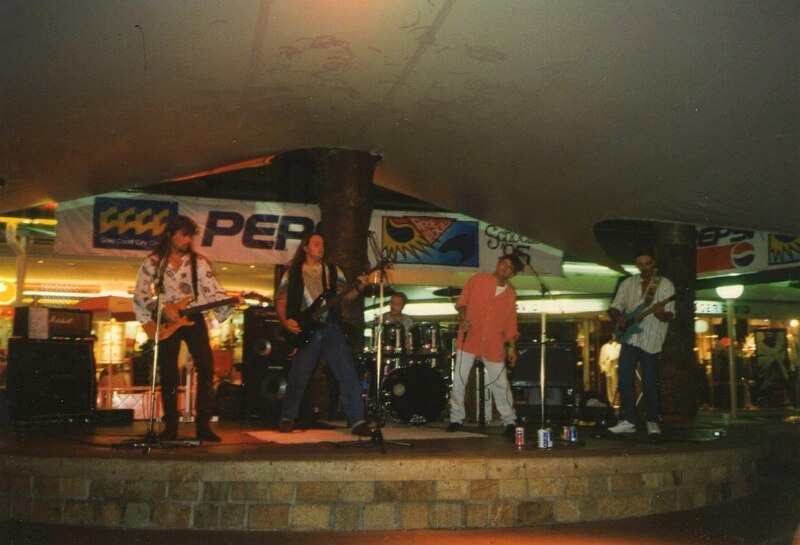 Over the 15-20 years I was in bands I was lucky enough to play at the Playroom, The Focus blues Club with Wiley Reed and other venues around the Gold Coast with some awesome musicians. 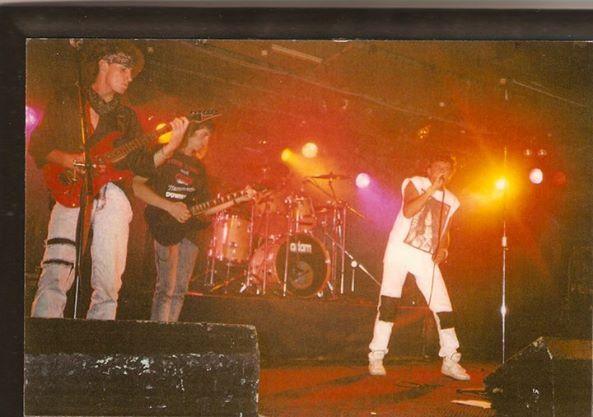 I was also in the first band ever to play the first Schoolies gig on the Gold Coast. That was held in Cavill Mall. Here’s a photo of that one and yes,that’s me in the red shirt having a head tilt. To be honest, the second we hit the ‘E’ chord to start belting out T.N.T. by AC/DC, Keep Them Separated by Offspring, Led Zepplin and other well known hard rock hits in Cavill Mall I was expecting to be asked to turn it down but it never happened. I also busked for years ago in Cavill Mall Surfers Paradise as well! That’s all well and good you’re thinking but what’s this got to do with direct response copywriting, marketing or personal branding Eddie? 12 years later I’ve realised how many similarities there are between playing in bands and starting a business, marketing a business and building a personal brand. #1. In business you must engage and connect with your audience. The same applies when you play in a band. #3. You must love what I do or it will show through. Yep that’s another one. #4. You must attract the right type of people. Sure do. I remember our drummer organised a gig for us at a end of year woman’s netball christmas party. It was the type of gig musicians love. Huge stage, great sound and payment upfront but all the women were all over 60. So the song sets made up of Jimmy Hendrix, Offspring, AC/DC and so on didn’t go over as well as we had planned. The crowd weren’t jumping they were covering their ears and boo-ing us. It’s okay though. Whether it’s business or life we all have to adapt and playing gigs is no different. After several boo’s we changed the sets and played a lot of Credence Clearwater, The Doors and other tunes from that genre. We finished up the gig up with encores and kisses on the cheek and a please come back. #5. Hmm, what other similarities are there between marketing and playing in bands? Oh yeah, you must not buy into personal or audience negativity. Hmm, sure I’ve read that somewhere. #7. You must produce results and do it consistently. Makes sense. So there you have it. If you’re a performer, musician, Entrepreneur or business owner what other similarities do you think there are? 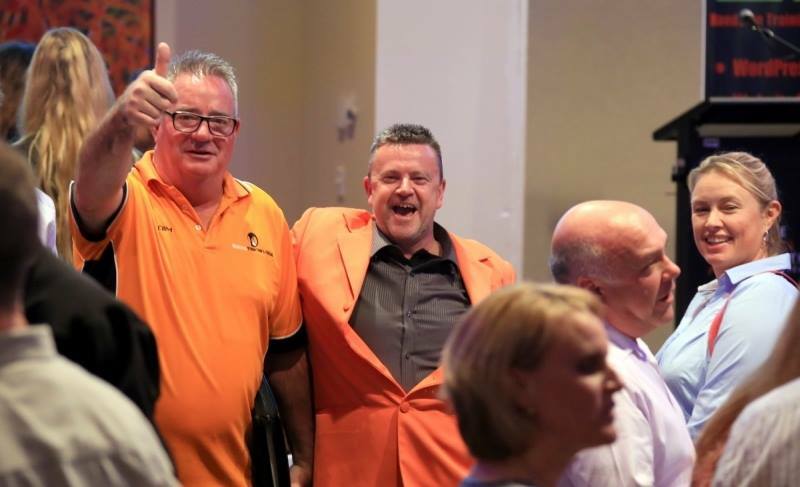 Jaffaman Eddie is highly sought out and outspoken Maverick Entrepreneur, marketer, direct response copywriter and personal brand authority challenging small and big businesses across Australia an internationally to think, act and market their businesses with passion, enthusiasm and consistency. 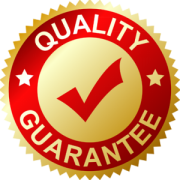 As one of Australia’s most trusted and recognised brands Eddie’s Enterprises and its services under the “Eddie” brand have been helping businesses escape random acts of marketing, weak copywriting and competing on price since 2003. Eddie’s Copywriting & Marketing Centre and other services under the “Eddie” brand have enabled Entrepreneurs, Franchises and business owners to multiply their business, incomes and lifestyles through his tried, tested real world proven copywriting and marketing services and principles. This could be Eddie’s copywriting coaching, The Eddie marketing club, Eddie’s information products, Eddies Copywriting and Marketing Academy, Eddie’s Website Design Centre and other Eddie services so start ups to corporate Australia can reach their full potential in the new economy and focus on adding value instead of competing on price. Both his outrageous lead generation strategies and increasing sales to existing client strategies have been featured in newspapers online and offline he’s a forthcoming author and recently he was nominated for A Telstra business award. Prior to starting out on his own 12 years ago he was Creative Director with Global Players Network. From 1988 – 1999 he was employed with Terry Morris Founder of Morris International, Sirromett Wines, Carrara Markets and other associated businesses. Thanks for the meal!! But yeah, thanks for spending the time to talk about this topic here on your blog.